My son has a friend “J” who loves super heroes. Whenever I see J, he is always wearing super hero gear. We are headed to his birthday party this weekend so I made him a Captain America birthday card. And like all great cards, I made sure the Captain America card would stand up for fun display value. This project was perfect for the June Silhouette Challenge “party” theme. Be sure to scroll all the way to the bottom of this post for more party ideas using the Silhouette. 1. I designed my card and cut it using the Silhouette. For the card base, I made a small portion of the bottom of the back of the card flat so it would stand up. The Silhouette cut shapes for the Captain America card were made using textured red, white and blue cardstock. Different shapes of the same color were cut at the same time. There were two white circles so I could have one for the inside of the card. 2. Run the white circles, small red circle, blue circle and white star through the Xyron 510 with the permanent adhesive. Load all the papers into the Xyron with the textured side facing up except one of the white circles. The adhesive is applied on the bottom of paper so this allows for the non-textured side of the white circle to be placed on the inside of the card so that it is easier to write on. I use Xyron adhesive on all my cards because it adds adhesive to the entire shape. 3. Lift the shiny layer off the Xyron adhesive sheet. Then layer the cardstock to assemble the card. Voila! J’s card is ready for his birthday party this weekend. If Captain America is also your favorite Avenger, you might also like my Captain America Tie Dye Shirts. 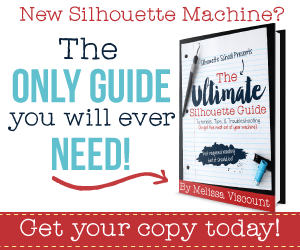 Grab a free Silhouette cut file for my All American Princess shirt in this post. Want free printable patriotic temporary tattoos? 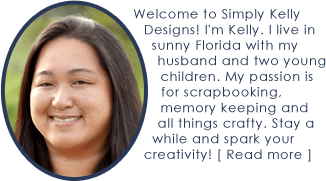 Grab my free designs in this post. 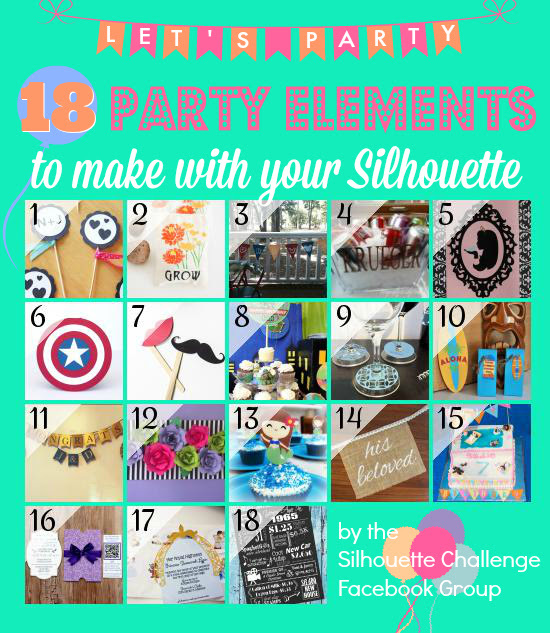 For more party ideas, check out the 17 other Silhouette projects that my Silhouette Challenge friends have for you below. Love all these party themed Silhouette projects. My son can’t wait to give J his Captain America card at his birthday party. I am sure I will be making more cards for all of my son’s super hero loving friends soon! My husband would also love this card for any occasion….he’s a big kid at heart. 🙂 And I so have to get me one of those Xyron machines….I’m tired of using spray adhesive or Zots! Thanks for this great tutorial! I love my Xyron Christine! You won’t regret that purchase! The refills are kind of pricey but I buy them on Amazon when I see a good price and with coupons in the craft stores. I love how you kept in mind cutting a straight edge on the back for display! You are so thoughtful. Thanks Michelle. I love cards that stand up so I am always make sure the cards that I make do that. 🙂 It was an easy trick to implement on this card. I bet J loved this card! It’s perfect! Thanks Emily! We are headed to J’s party on Sunday. My son has requested I make him a batman card just for fun. What a great Card! Hope you all have a great party this weekend. Thanks Meredith! We made those shirts two years ago and my kids still wear them. It makes me a little sad to look at that picture because they have grown up so much since then! Fantastic superhero card! Thanks for sharing the additional ideas, too. This is so cute, and it would make awesome invitations too! Pinning it! Thanks for pinning Jessi! Yes this could easily be turned into an invitation by using print and cut or sketch pens. Thanks for sharing this idea!! What sizes are your circles? I’m terrible at estimating. Thx!! Hi Angela. Thanks for dropping by! Unfortunately I don’t have the dimensions because I gave away this card. If I had to guess I would guess that the large red base is a 4 inch circle. My daughter also has a friend (and she is also) obsessed with superheroes! Oh and I have now decided I MUST have a Xyron machine! That thing is like magic! Aww this is cute! I hope he likes his card! I’m so glad I bought my Xryon…it’s so useful!! Long live Xyron! Really it is the BEST adhesive. Just remember to use coupons for the refills. They are kind of pricey. I also love ATG from Scotch.